Blood Creek Terror Trail is a Haunted Attraction located in Cowpens, SC. Blood Creek Terror Trail (BCTT) has its own little backstory. Originally the site of another haunted attraction decades ago, that old attraction has been closed and gone for a generation – but the bones of it continued to rest in the hills of upstate SC. 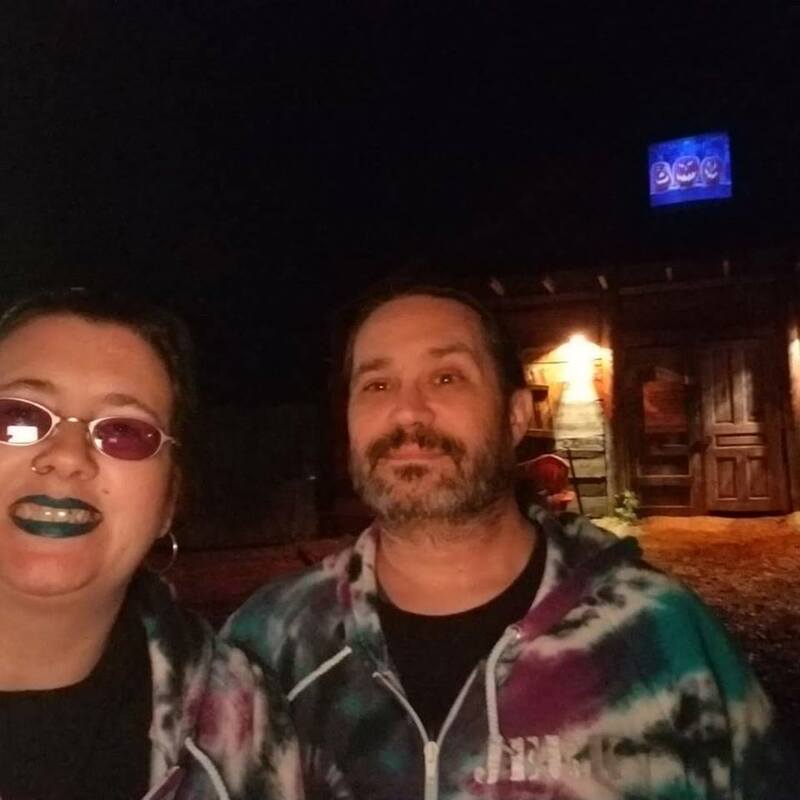 For the past year, the owners and operators of BCTT have been clearing land and exposing the creek and working at bringing BCTT back to life (or should we say unlife) as a haunted attraction. This year marks the opening of BCTT, but rest assured that there is still a core component behind the scenes with years of experience pouring into the Blood Creek. The cast at Blood Creek Terror Trail consists of around 30 actors and guides. The guides help you move from scene to scene, sometimes giving you some narration and identifying what it is that you’re approaching, sometimes becoming a part of the action themselves. While the guides do seem to have some heavily-scripted lines at times, several of them are a part of the scenes and have a good handle on customer rapport and banter. This also applies to the actors themselves. There were some great lurkers, like a fully-costumed Michael Myers, and some great wielders of dialogue, like a certain high-energy clown. The actors, overall, were very interactive, getting close to guests, moving around the entire group, and playing their parts with gusto. That said, this was BCTT’s first year and, for some of the haunters, it was their first year working as well. Some of their timing and performances aren’t as polished as you may find at other larger, longer-established haunts, but they’ve got a solid base, supportive staff, and a great start to build upon as the years go by. Over time, we expect to see BCTT develop a closet of appropriate clothing and attire, costuming, make-up, and masks. There are a few examples of street clothes, of simple and unadorned black robes, and jackets visible across the cast. While some of this can be forgiven, depending on the role portrayed (and the temperature outside), across the haunt as a whole, there was perhaps a bit too much of it. From the name Blood Creek and the stories of the murders that took place to make the local waterway run red, we expected to see a bit more gore and distressing of the costumes. In the years to come, we hope that the cast will delve more and more into personalizing their characters and mingling those with the story of Blood Creek to create a cohesive costuming scheme that they can all work with. BCTT is easy to find. In addition to a sign out front, they’re the only points of light in the darkness of an upstate back road, beckoning from the hillside above. GPS easily gets you on the doorstep of the haunt and its relatively secluded location seems picture perfect. 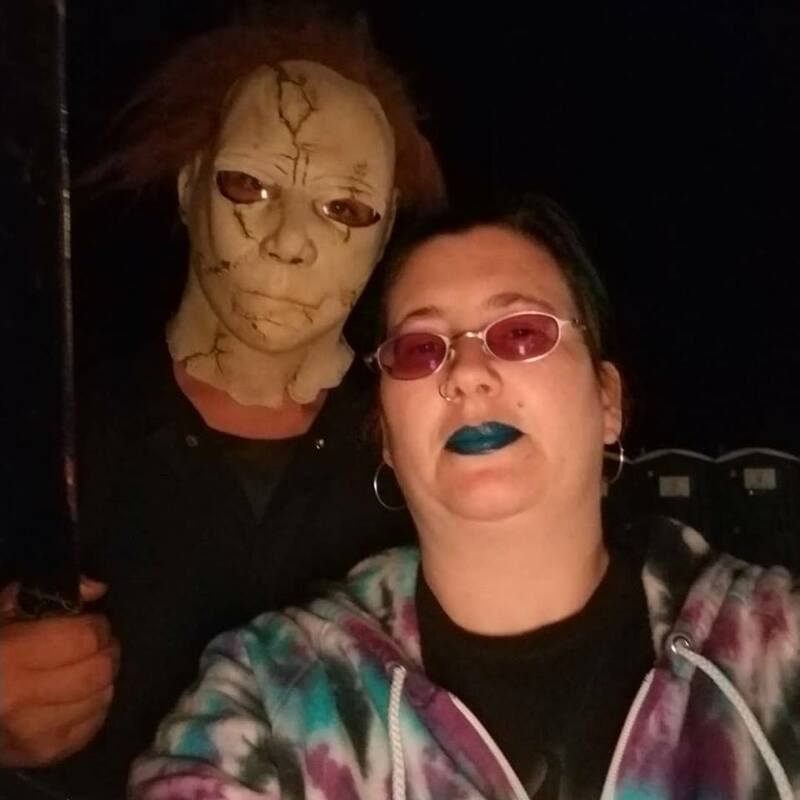 The staff, whether costumed or not, are great people that are invested in not only making their haunt a success, but also providing an entertaining experience at an affordable price. Since this is essentially a trail walk through the foothills, the guide that accompanies your group is a welcome addition to your traveling party, providing light when necessary, and backstory when you approach a scene. You will be climbing and descending the banks and hills above and around a forested creek. Be sure to wear appropriate clothing and shoes when you visit; the staff of BCTT will do their best to entertain and guide you, but visitors need to put in the forethought of dressing appropriately for the activity. Furthermore, the haunt is already invested in being a part of their community, providing space for fund-raising and support. That kind of out-reach is not to be dismissed. 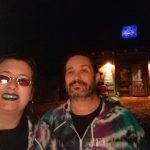 Many non-charity haunts eventually do find ways of giving back to the community, so to see BCTT doing so on their first year in operation reveals a lot about the heart beating in the center of this haunt. As mentioned above, Blood Creek Terror Trail has atmosphere. Set back from the road with the trees looming overhead, this haunt is ready to get you in the mood from the time you exit your car. The ticket booth is sufficiently distressed enough to have been pulled from the muck of the nearby creek that runs through the property. Moving down to the entrance of the haunt/trail is a large and elaborate facade, decorated and detailed with attention and care. The facade is topped with a projected display offering up entertainment for those who can’t bear to look at the costumed actors who are out and working the queue. Beyond the facade, the echoes of chainsaws, screams, and the occasional cat-called name help to ramp up the anticipation and eagerness for the front door to open and usher you into the darkness beyond. Even for a first year haunt, Blood Creek Terror Trail has clearly put in some thought and hard work to bring in some effects designed to startle and alarm. Music is used to good effect in a couple of scenes, but is not overpowering. The ever-present roar of a chainsaw, ubiquitous to any Southern haunt, are present here as well in a few locations. Set pieces, much like the exterior facade, make some appearances within. An owl-topped arch and a cemetery entrance are notable for their design work and, of course, we would be totally remiss if we did not mention the titular Blood Creek. You’ll get to cross the creek twice during your visit and, even though the waters will be dark during the night, you’ll be assured of seeing them running red. We would have liked to see more detail make it into the individual scenes; that’s certainly an area we’re very hopeful to see BCTT tackle as the years go on. They’ve demonstrated that they can bring out some great levels of detail and set-building, that they’re conscious of how props and lighting and music can build into a scene, and we’re excited to see what they’ll come up with next to grow their haunt. The actors do a great job of staying in character in order to maintain the suspension of disbelief – even when they’re snatched and kidnapped from right in front of you. We never did see that guide again. Michael Myers, though taunted by teenage visitors almost incessantly, never spoke or returned the attention except to loom menacingly with his height and glare silently while gripping his chosen blade. Though not heavily explicit, the theme as you wander through the scenes of Blood Creek Terror Trail is that of murder. The murder of men, innocent or guilty, carries through from scene to scene – whether you’re viewing a creek running red with blood, an empty grave for a slain man, or pulling the lever on the scaffold to drop a man condemned to hang, murder is the overarching story of the night. Some aspects of the haunt might be a bit of a stretch for such a theme, but most haunt-goers are used to the idea of murderous clowns or sinister doctors or even locales like abandoned mine shafts that such sights fit right in with BCTT’s story of death come too soon. The crew at Blood Creek Terror Trail do a great job of working the whole crowd. There are a few front-loaded scares and some jump scares from actors popping out from thin air, but the actors also do their best to space these scares out around the whole group as best they can, looming and taunting the back of the line when they can’t. Timing and distractions are still being worked out by this group of first-time haunters; they’ll quickly learn how to adapt to their ever changing audiences. After the final scene rushes out at you, there is still a bit of a walk back out to the parking area. Perfect for calming your racing nerves and catching your breath and just enough to leave you wanting more. Blood Creek Terror Trail is a short haunt; we made it through from the front door to the back yard in approximately 13 minutes. But, for a $10 price tag, that’s not bad. Too, such a cost is something that will be easier for families or small groups of teens to easily bear; providing the anchor to an evening’s fun in a reasonable price is one of the staff’s goals. They’re certainly on target for that. We arrived at opening and managed to beat any of the lines that BCTT is sure to draw, but were still able to get a sense of the line entertainment outside the opening facade. Blood Creek Terror Trail may be in their first year, but they’ve got plenty of room surrounding their current setup to slowly expand and grow year by year. We can’t wait to see what they accomplish as time goes by and will be eagerly awaiting the waters to run red once more! 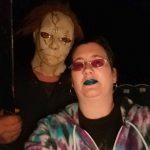 Omg this is the best trail I have ever been through and Drakes house is the best part out of all of …show more this trail the bridges across the creek blowed my mind I have never seen water turn to blood my second favorite was the clown and michale Myers walking around in the parking lot. Classy service. Great set up. Awesome guide. Convenient location. Love to see a brothers come together and enjoy each other while showing off their skill and passion …show more for the season! The price was reasonable and the atmosphere was what a trail should be. The trail is relatively short but incorporated some very creative ideas and the actors were appropriate for each scene. Was impressed by the bridges over the creek and the time put into each structure. Look forward to seeing the growth and future success of the trail! The customer service is by far the best I have seen at any attraction! Keep up the good work guys!